Today we’re heading up bustling Kloof Street to an exciting new Indian restaurant. 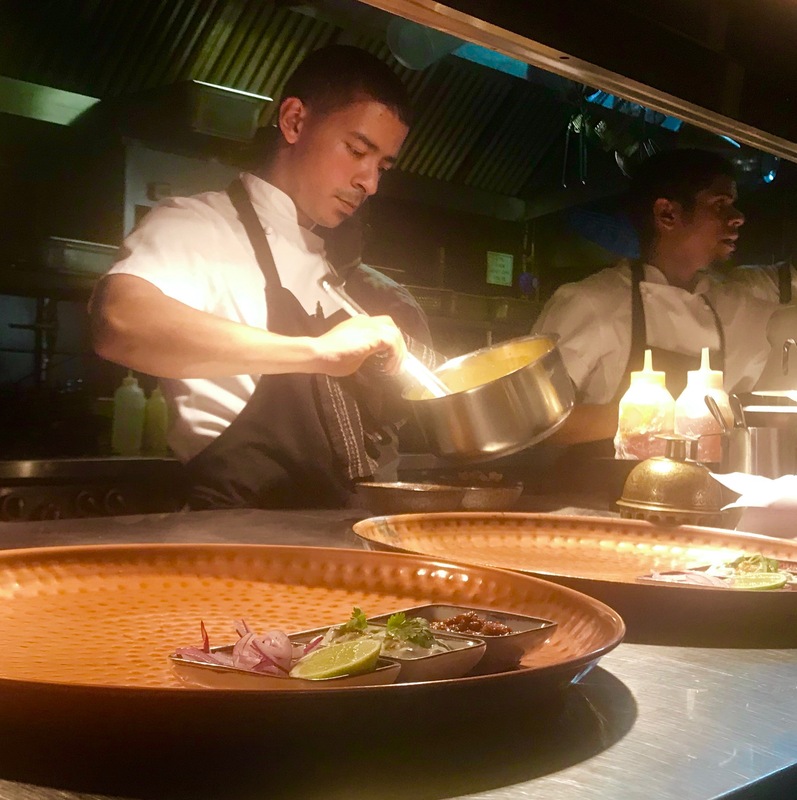 It’s the brainchild of Chef Liam Tomlin – who runs the successful Chef’s Warehouse in Bree Street (where I still haven’t been – must remedy that soon) and also recently took over the kitchen at Beau Constantia. 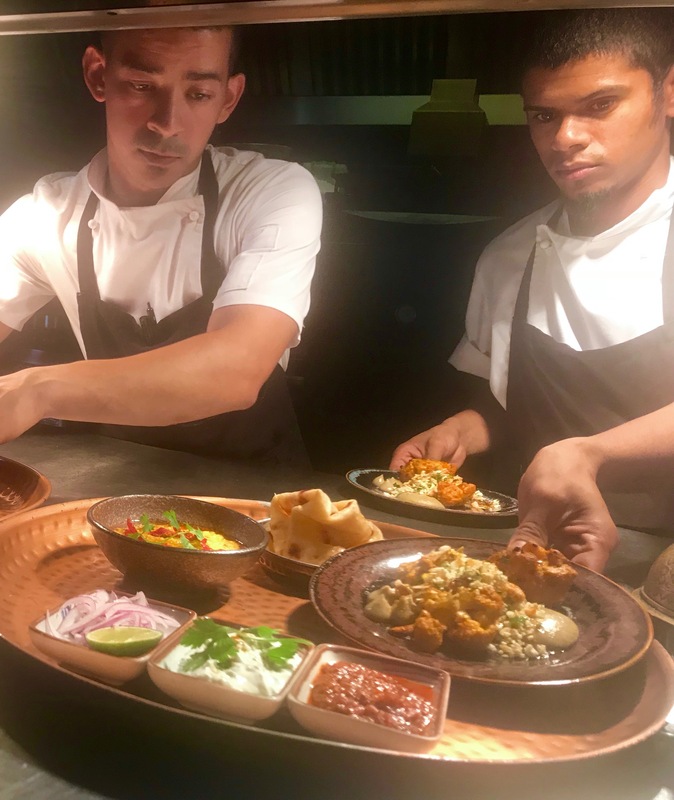 Thali has the same menu concept of Tomlin’s other two restaurants – a set menu of dishes to share that come up in groups, making for four tasty courses. 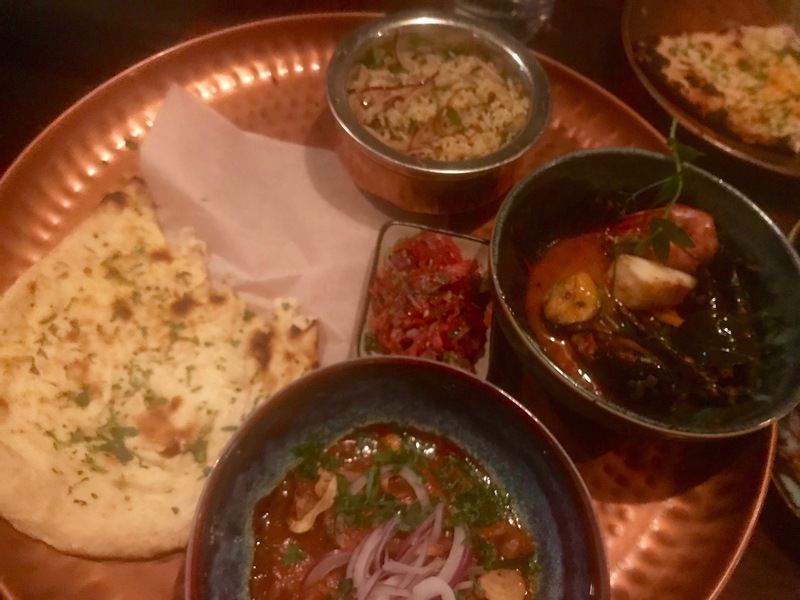 Thali literally means “a set meal at an Indian restaurant” which for me means the joy of no menu indecision and a chance to taste everything the chef wants to offer. The food comes served in small dishes arranged on large round copper platters which look stunning but do make photography tricky (food blogger problems!). However, I’ve done my best to give you a good flavour of what’s in store. 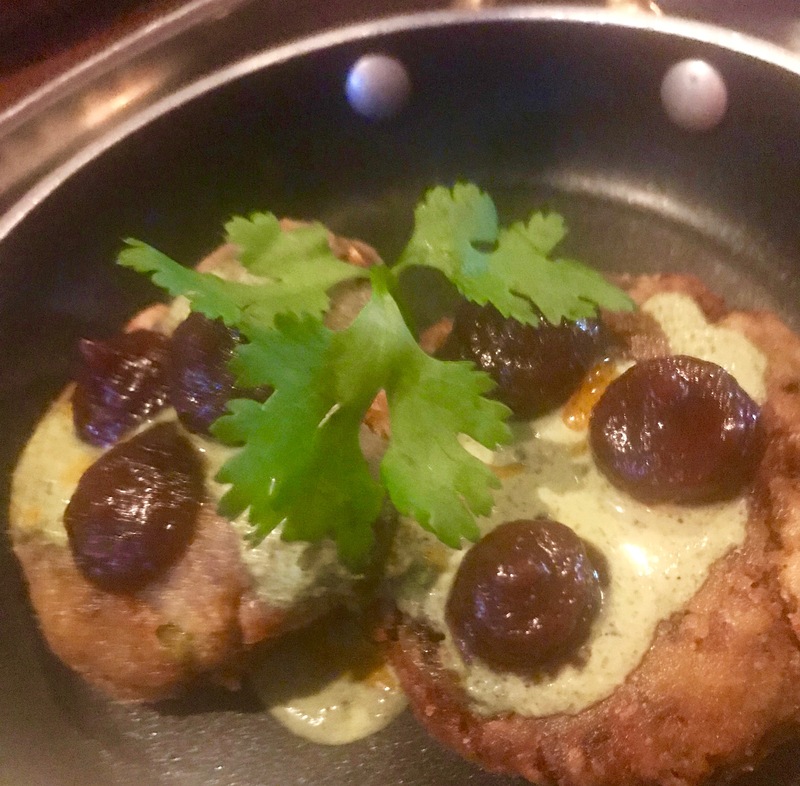 So first up we received the Aloo Tikki, a beautifully soft and spicy potato cake served topped with yogurt and a touch of tamarind paste. I love potatoes and I could definitely consume this version of my favourite starch on a regular basis. It’s served with curry salt and spices which you keep on your table for the duration of your meal. 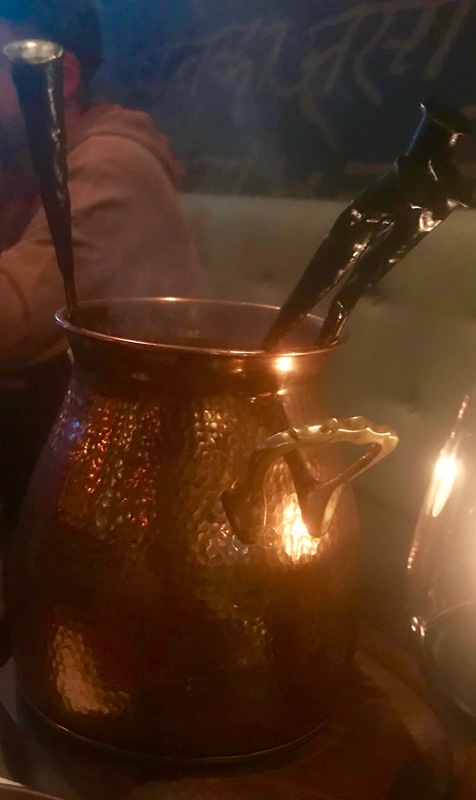 Our next course consisted of three dishes (dhal, cauliflower and tandoori chicken), a buttery paratha, two dipping sauces and an onion mix. 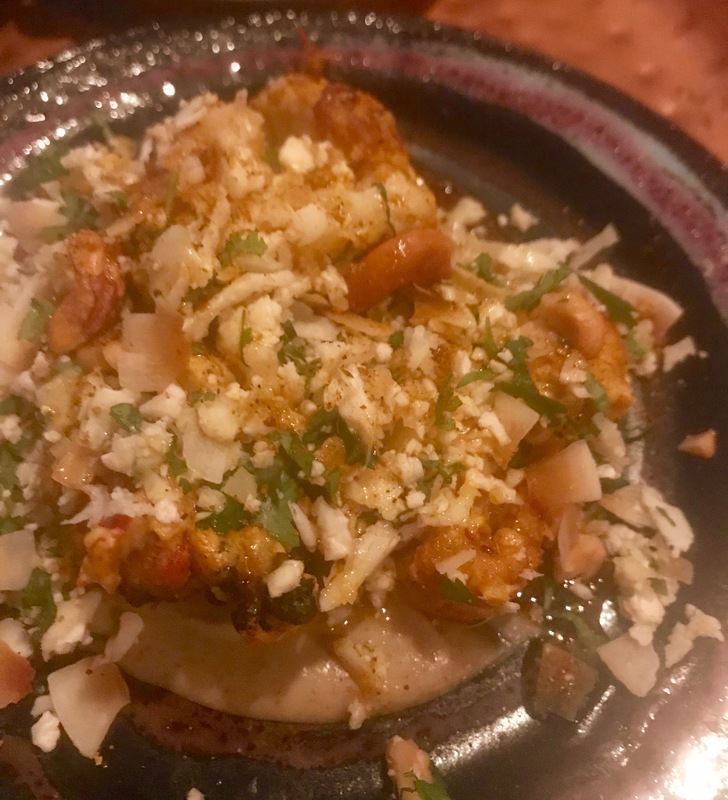 The cauliflower plate was a veggie revelation with Tandoori cauliflower and cumin cauliflower puree served with a cashew and coconut sauce. A genius way to showcase the humble cauli, producing a dish with incredible depths of flavours and a wonderful range of textures. 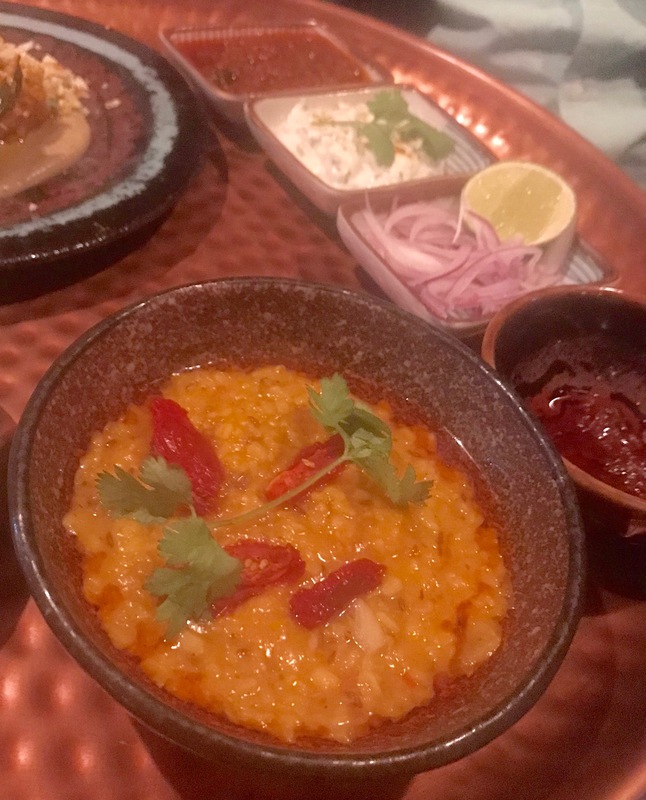 Beautifully flavourful and creamy smoked tadka dhal was served with the softest of buttery paratha. Dipping heaven. And the tandoori chicken skewers arrived in their own little tandoor, complete with burning coals. 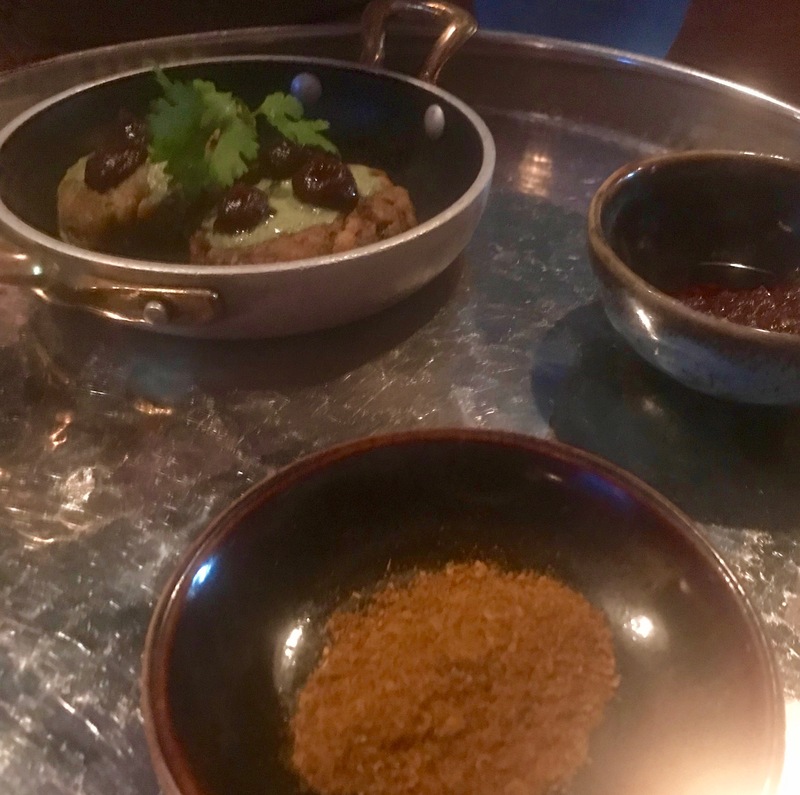 Great theatre and these little morsels were so perfectly cooked they melted in the mouth giving a pop of those tasty tandoori flavours. Another wonderful dish that was very difficult to photograph well, but you get the idea. The fish course added a real freshness to the dinner. The fried fish tacos were packed with juicy cubes of kingklip, crunchy fresh veg and chilli. 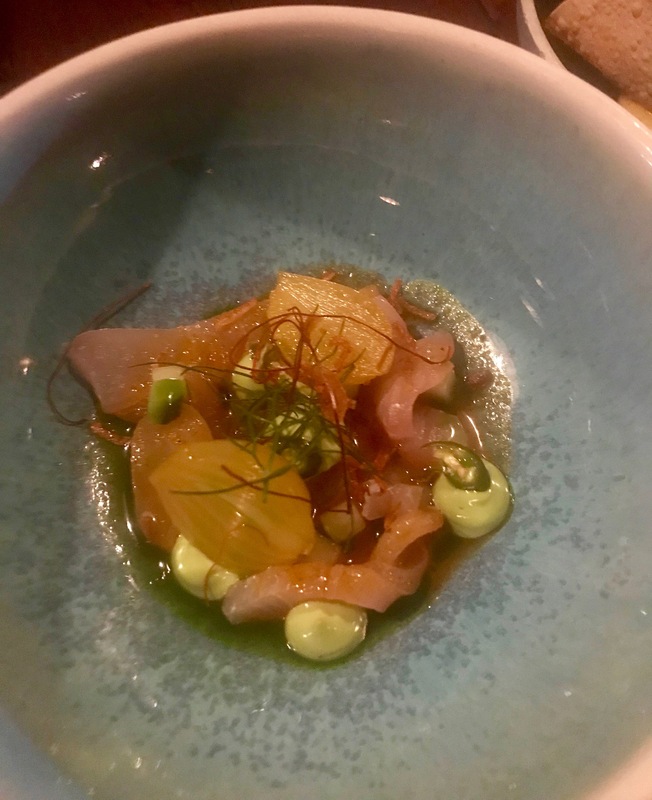 Unusually for an Indian restaurant, a ceviche-style bowl of raw line fish was served with a Cape Malay dressing, coriander emulsion, saffron and pickled onion. Even more fabulous flavours and textures to savour. Our final tray of delights brought the curry element to our table. Another incredible combo of dishes. Two curries, served with rice and naan – the perfect ending to our Indian extravaganza. 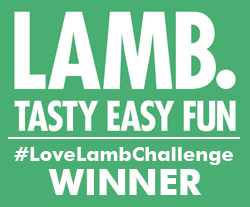 The smokey lamb curry was packed with flavour with a silken sauce and wonderfully tender meat. The Panch Phorand seafood curry was possibly my favourite dish of the night. Wonderful cubes of flaky fish, plump prawns and the freshest of mussels in a rich and spicy sauce. The mussels are so fabulous in Cape Town at the moment. So I’m eating them whenever I have the chance and boy were they great in this curry. The rice was also spectacular – which I think is a sign of a really great chef. 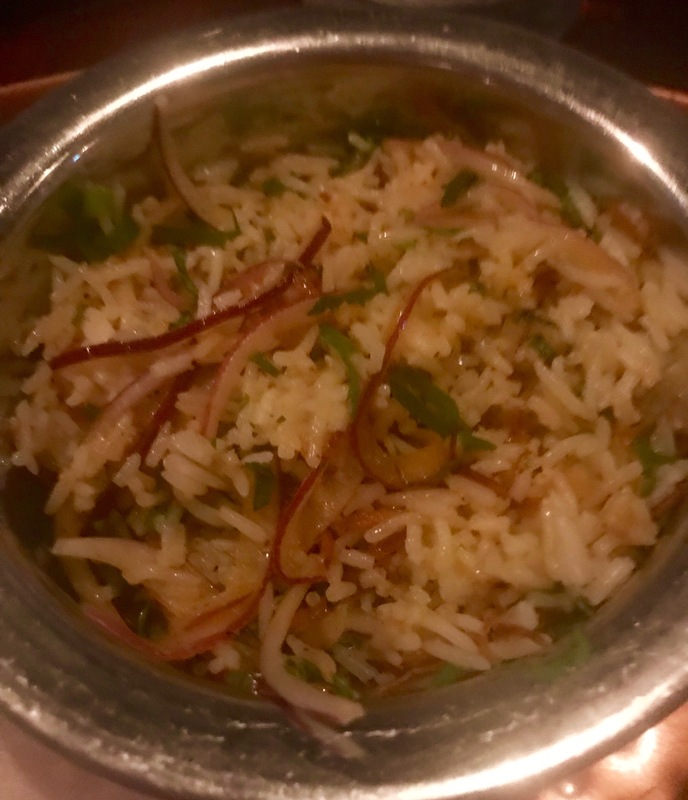 I battle with cooking good rice dishes – wonder if they’d be available to give me some lessons? Phew! What a great selection of dishes. Portions are substantial at Thali, and there’s quite a lot of heat in the sauces, dips and spices. You can taste the love and care that everything has been prepared with and you can feel the energy emanating from the busy kitchen. 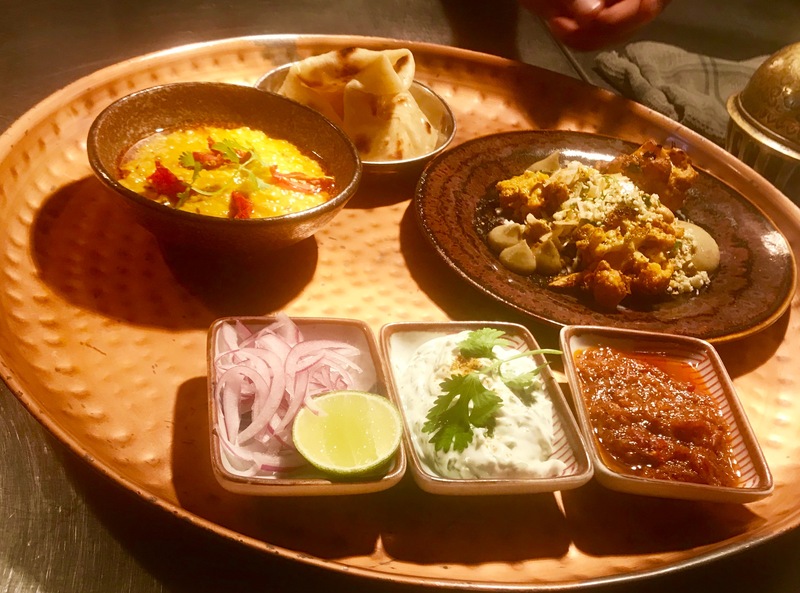 Thali doesn’t take bookings (one of my pet hates) so we got there just before 6.30 to make sure we could nab a table for six. The restaurant was already about three-quarters full and soon filled up completely. While we were having dinner people queued up at the bar and some didn’t even stay, having been told they would have over an hour to wait. This is one popular place! Because of this service may be inconsistent. The menu tells you to expect a selection of dishes to share which can take up to 90 minutes – it will probably take longer (as it did in our case). But what’s the rush? Arrive prepared to take your time and enjoy the courses as they come and I guarantee you’ll enjoy a wonderful Indian extravaganza. And finally, Thali for two is R700 (about £45 at today’s exchange rate). It really is an amazing place – and so crowded as people are flocking there. Keen to go back again in a couple of weeks – you should join us! I always look forward to your food posts!! Which was your favorite dish? Looks delicious! Love the idea of having your own tandoori! Looks delicious! I’m getting hungry just looking at these! Thank you Lorial. That’s a hard one! 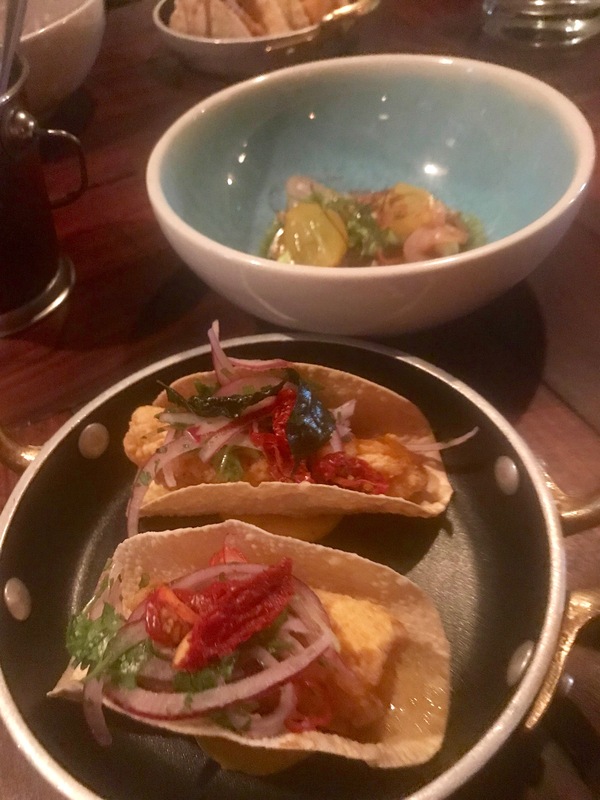 I did love the fish tacos, the fish was so perfectly cooked. 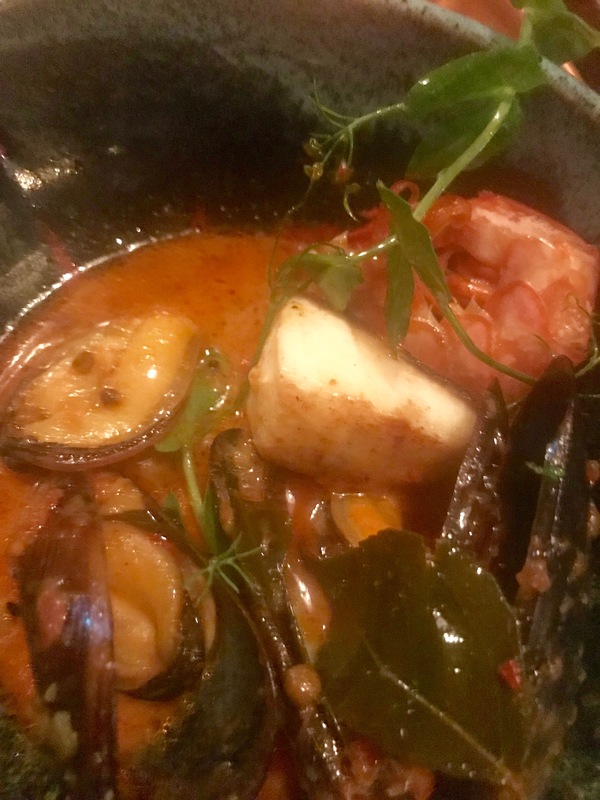 The seafood curry was also amazing though – as was the lamb – well as was everything. Think I better go back and try to pick a favourite! Such a great restaurant. Yes, the little tandoori oven was a really clever touch. I’m getting hungry just thinking about going back there.